Faculty input is key to developing the library’s collection to meet the curricular needs of the Seton Hill community. Faculty may request that the library purchase a new item for the collection using funds from the library budget. 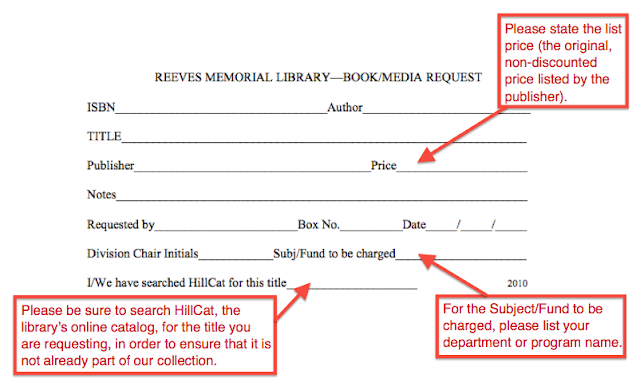 To request a new item for purchase, simply fill out a “Book/Video Request” form. The form is available as a one-page Microsoft Word document containing six copies of the request form, and is available under MySHU > Forms > Library. Completed forms must be sent for approval to the appropriate academic school dean or program director, who will initial the form and send it to the library for acquisition. Requests that cannot be fulfilled using the current year’s funds will be held for purchase until the following budget year. Please fill out the request form as completely as possible, providing all necessary information that is readily available. If you would like to find out about new resources that are available for request, there are many helpful tools at your disposal. Publisher websites and print catalogs are an excellent source of information on new and forthcoming titles, and usually allow you to browse by topical area. If you have access to The Chronicle of Higher Education, that publication's weekly book lists (which are available online to subscribers) are another great source of information about new titles. The website and online store for the large bookstore chain allows you to search for titles in a wide range of formats and topical areas. Online store offering detailed information and reviews of new and older titles in a wide range of formats. One of the leading providers of media for higher education, offering thousands of DVD and streaming video titles in a wide range of topical areas. Online store featuring videos from numerous PBS series such as Frontline, American Experience, Nature, NOVA, Independent Lens, and Great Performances. Distributor specializing in DVD and streaming video sales for independent educational documentaries. The selection of documentaries covers a broad array of key global issues and social problems.